Here on business? We have Meeting Facilities and the necessary amenities to make your meeting a success. Enjoy a complimentary Deluxe Continental Breakfast off our airy lobby. Work out in our Fitness Center. Relax poolside in our expansive courtyard. Rooms are spacious, with Deluxe Kings boasting a Microwave, Refrigerator, and Recliner. 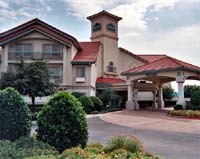 The La Quinta Inn and Suites-D/FW Airport North is convenient to Michael's corporate offices, Standard Motors, American Airlines and NEC Training centers, and a short drive to conventions at the sprawling Gaylord Texan. Located at DFW north entrance with easy access from Highway 114 (exit Freeport Parkway). Free Airport Shuttle. Take North exit out of airport to Hwy 114 E exit Freeport Parkway, go straight through traffic light. Stay on the service road, the hotel is located on the right.